Marble-effect floors are covering solutions fulfilling the dual function required of the best porcelain floors, that is, a practical and an aesthetic role. In functional and technical terms, marble-effect porcelain tiles reveal the best qualities of contemporary ceramics, offering a variety of excellent solutions for homes, businesses, public places and renovation projects both large and small. Strong, non-absorbent and easy to maintain, porcelain is unmatched on the scene of ceramic materials and contemporary surfaces of all kinds, as demonstrated by the very high standards achieved according to the sector’s quality parameters. In aesthetic terms, today’s marble-effect porcelain tiles offer a choice of a vast range of proposals exploring the expressive potential of the rarest and most valuable natural marbles. What’s more, the perceived value of every space is underlined by the slabs’ large size, a solution optimising the many refined details of marble, its luminosity and expressiveness, and thereby amplifying freedom of design. The large format considerably reduces the number of interruptions of the design’s unity, while the vast range of available sub-multiples permits great versatility, responding to the architect’s stylistic choices and the customer’s desires. 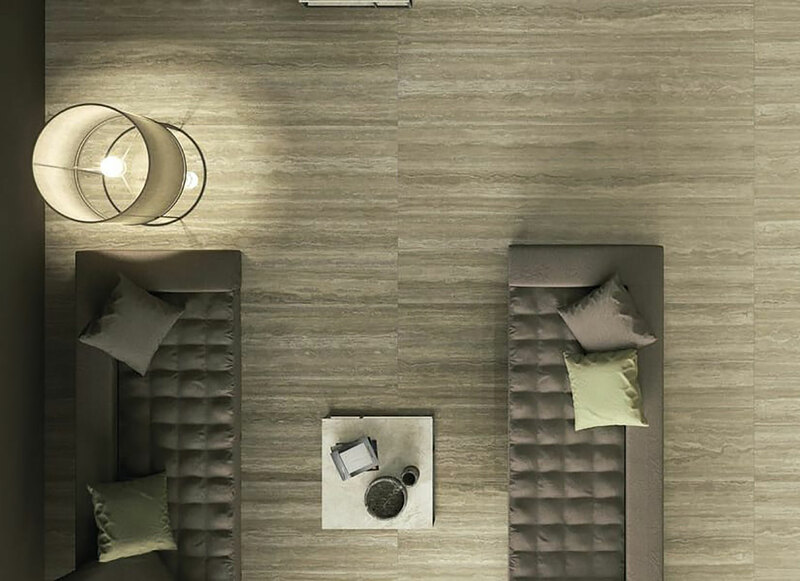 GranitiFiandre offers the extra-large Maximum collection, "the biggest slabs available on the porcelain market, unadulterated by agglomerates: a product made from carefully selected raw materials". Maximum maxi-slabs in the 300x150x6mm size weigh only 14 kg per square metre, and have a perfectly smooth finish unique on the maxi-slab market. A minimum thickness of 6 mm creates a perfectly smooth surfaces, making Maximum a simple yet particularly lightweight material, despite its considerable size. Light weight is particularly important during laying operations (cutting, perforation, grouting, etc. ), for covering walls and countertops, false ceilings, dividing walls and surfaces in yachts. Maximum may therefore be considered a true item of furniture and element of design for customising tables, sliding doors, ceilings, backdrops and backlit walls. 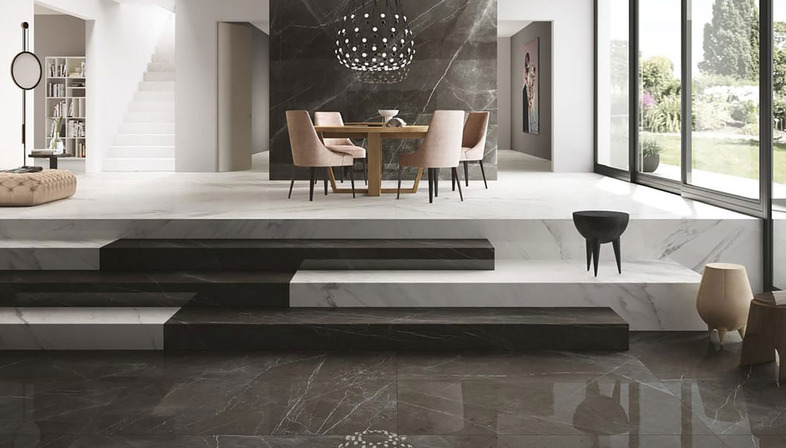 The many Maximum collections include 15 shades of Marmi slabs representing a cross-section of the tradition of transforming geological surfaces into surfaces for living, from the lightest colours such as (Taxos, Bright Onyx, and Premium) to the new dark marbles Nero Supremo and Dark Marquina, all characterised by particular elegance and refinement. Like the other brands in the Iris Ceramic Group, GranitiFiandre pays special attention to the environment with a truly sustainable production cycle. Starting with a reduced size "permitting use of 2 to 3 times less raw materials with respect to natural quarried stone and consuming less energy in production", GranitiFiandre proposes environmentally friendly materials with LEED certification and the new certification offered by Bureau Veritas, a world leader in the assessment and analysis of quality and environment-related risks in industry. Maximum large slabs can also be made "eco-active" with the new Active Clean Air & Antibacterial Ceramic™ technology, increasing and improving the photocatalytic performance of maxi-slabs from the point of view of efficient breakdown of airborne pollutants and odours and anti-bacterial action. The titanium dioxide (TiO2) fixed onto the slabs at high temperatures, when simply exposed to light (either natural or artificial) allows Active Clean Air & Antibacterial Ceramic™ to activate a process of photocatalysis, reducing pollutants by up to 70% (particularly nitrogen and sulphur oxides) and permitting anti-bacterial action against the strains of bacteria that normally attack surfaces and coatings (Escherichia coli and other pathogenic agents). The new Iris-GranitiFiandre technology uses titanium dioxide in micrometric form with an "improved uniformity of distribution of photo-active material over the surface of the slabs, improving the efficiency of the photocatalytic process underlying Active Clean Air & Antibacterial Ceramic™" without altering the properties of the porcelain, thereby permitting application to floors and walls either indoors or out and to custom furnishings.